ApacheDS™ is an extensible and embeddable directory server entirely written in Java, which has been certified LDAPv3 compatible by the Open Group. Besides LDAP it supports Kerberos 5 and the Change Password Protocol. It has been designed to introduce triggers, stored procedures, queues and views to the world of LDAP which has lacked these rich constructs. Since its initial version, ApacheDS has been certified by the Open Group which guarantees conformance of directory servers to version 3 of the LDAP protocol. ApacheDS uses an adaptation of the X.500 basic access control scheme in combination with X.500 subentries to control access to entries and attributes within the DIT. Not only is ApacheDS an LDAP server, it also supports the Kerberos protocol being a KDC (Key Distribution Center), a TGS (Ticket Granting Server) and an AS (Authentication Server). Multi-master replication support via RFC 4533 (Content Synchronization Operation) has been added to ApacheDS 2.0, making it also compatible with OpenLDAP. ApacheDS supports the "Password Policy for LDAP Directories" RFC draft, allowing it to enforce a set of rules designed to encourage users to employ strong passwords and use them properly. The configuration of ApacheDS relies on an LDIF file, a well known format for people working around LDAP technologies, making it easier to configure the server. ApacheDS has been written in Java, one of the best object-oriented programming languages, which makes it easy for developpers to embed in their own Java applications. 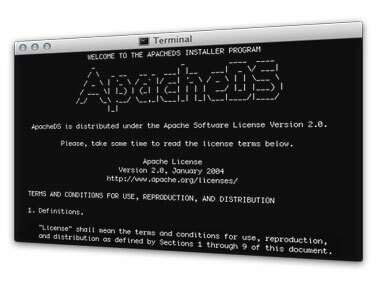 ApacheDS is available on most operating systems (Linux, Mac OS X & Windows), with dedicated installers for each platform (.deb, .bin, or .rpm packages, Windows installer, .zip and .tar.gz archives, etc). The Apache Directory team is pleased to announce the release of ApacheDS 2.0.0.AM25, the 25th milestone towards a 2.0 version. This is a major release of ApacheDS. It uses the Apache LDAP API 2.0.0.AM1 release, which itself brings a lot of improvements and bug fixes. But the major improvement is the cross-indexes transaction support that has been added, which is expecting to solve the database corruption issue we are facing for years. The Apache Directory team is pleased to announce the release of ApacheDS 2.0.0-M24, the 24th milestone towards a 2.0 version. This is mainly a maintenance release, and it's needed to be able to release Studio with many fixes related to the server itself. The main fixes are related to SyntaxCheckers, which are now immutable, and the switch to LDAP 1.0.0 which fixes a critical SSL issue. Otherwise, the 'repair' command has been fixed, and a thread leak has been fixed. In order to repair the database, one has just to start the server passing the 'repair' command to the apacheds script, instead of the 'start' command. The server will start after having repaired the database. The Apache Directory team is pleased to announce the release of ApacheDS 2.0.0-M23, the 23th milestone towards a 2.0 version. In order to repair the database, one has just to start the server passing the 'repair' command to the apacheds script, instead of the 'start' comamnd. The server will start after having repaired the database. The Apache Directory team is pleased to announce the release of ApacheDS 2.0.0-M22, the 22th milestone towards a 2.0 version. This release is a bug fix release. We also added a 'repair' mode taht can be used to fix a database corruption : you just have to start the server with the 'repair' parameter. This release also fixed the painful problem we have in Studio, when trying to save the configuration. The Apache Directory team is pleased to announce the release of ApacheDS 2.0.0-M21, the 21th milestone towards a 2.0 version. This release is a bug fix release. We fixed some random failures on startup, and some fixes in the start scripts, beside many other smaller issues. The Apache Directory team is pleased to announce the release of ApacheDS 2.0.0-M20, the twentieth milestone towards a 2.0 version. DIRSERVER-1809 - Allow password policy changes to take effect without server restart. The Apache Directory team is pleased to announce the release of ApacheDS 2.0.0-M19, the nineteenth milestone towards a 2.0 version. This release is a security fix release : the server is not anymore accepting SSLv3 as a valid protocol. The Apache Directory team is pleased to announce the release of ApacheDS 2.0.0-M18, the eighteenth milestone towards a 2.0 version. The Apache Directory team is pleased to announce the release of ApacheDS 2.0.0-M17, the seventeenth milestone towards a 2.0 version. The Apache Directory team is pleased to announce the release of ApacheDS 2.0.0-M16, the sixteenth milestone towards a 2.0 version. DIRSERVER-1676 - Provide a set of error codes along with an AuthenticationException to indicate its root cause. The Apache Directory team is pleased to announce the release of ApacheDS 2.0.0-M15, the fifteenth milestone towards a 2.0 version. The Apache Directory team is pleased to announce the release of ApacheDS 2.0.0-M14, the fourteenth milestone towards a 2.0 version. This release does not contain any change, but it depends on a new version of the Apache LDAP API, which contains a fix for a critical bug. This is a critical version, and anyone using 2.0.0-M13 should replace it with this version. The Apache Directory team is pleased to announce the release of ApacheDS 2.0.0-M13, the thirteenth milestone towards a 2.0 version. DIRSERVER-1500 - Error searching children of known element. DIRSERVER-1521 - dc=example,dc=com DIT no longer exists as a default partition (DIT) in 1.5.7? DIRSERVER-289 - Configure an optional password message digest algorithm which is applied on userPassword attribute values at add and modify operations. DIRSERVER-1346 - Use ServiceLifecycleListener to avoid having System.out messages for service start/stop events. This is a critical version, and anyone using 2.0.0-M12 should replace it with this version. The Apache Directory team is pleased to announce the release of ApacheDS 2.0.0-M12, the twelwth milestone towards a 2.0 version. This is a critical version, and anyone using 2.0.0-M11 should replace it with this version. The Apache Directory team is pleased to announce the release of ApacheDS 2.0.0-M11, the eleventh milestone towards a 2.0 version. Note that this is a milestone, and some parts of the API or configuration can change before the 2.0 GA. We don't have any defined time frame for the 2.0-GA release, we do expect to release a few more milestones before reaching the 2.0-GA. The Apache Directory team is pleased to announce the release of ApacheDS 2.0.0-M10, the tenth milestone towards a 2.0 version. The Apache Directory team is pleased to announce the release of ApacheDS 2.0.0-M8, the eigth milestone towards a 2.0 version. DIRSERVER-1735](https://issues.apache.org/jira/browse/DIRSERVER-1735) - When ads-pwdmaxage attribute is set to more then 2147483, then all user passwords are expirer forever. The Apache Directory team is pleased to announce the release of ApacheDS 2.0.0-M7, the seventh milestone towards a 2.0 version. The Apache Directory team is pleased to announce the release of ApacheDS 2.0.0-M6, the sixth milestone towards a 2.0 version. DIRSERVER-1681 - adding entries with attribute userCertificate;binary fails with "No such attribute"